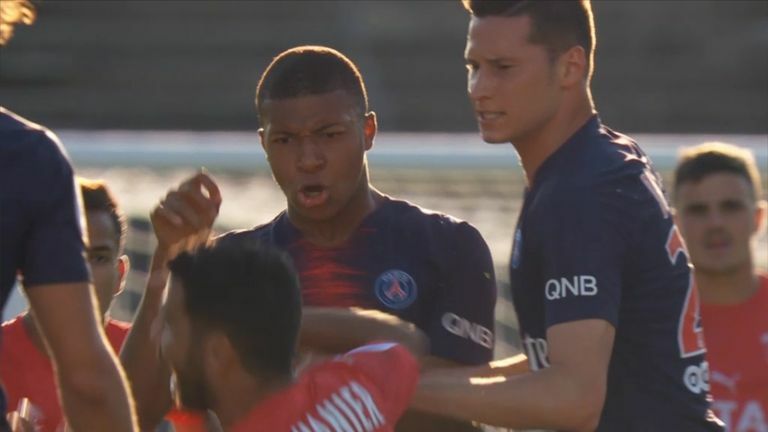 Kylian Mbappe's brilliant goal was overshadowed by a late red card as Paris St-Germain won 4-2 at Nimes on Saturday. The 19-year-old put PSG 3-2 ahead when he controlled a long pass and then fired past the goalkeeper. However, he saw red in the closing stages for his reaction to a challenge by Teji Savanier, who was also sent off. Mbappe had been booked earlier in the game for dissent, but said he did not regret pushing Savanier after a late tackle on the halfway line. "It's just an accumulation of things. It's football," he said afterwards. "You have to learn when playing in this kind of club to let it go because it's like that every time so if I get upset every weekend, I'm going to take several reds so we have to be above it. "No, I do not regret it. And if it was again, so I will do it again. And I will apologise to supporters and everyone but I cannot tolerate these kinds of gestures." Jeff has given away over £1.5m over the last fortnight! Enter your predictions for free here.